“Let’s Spend the Night Together” is a song by Mick Jagger and Keith Richards, originally released by The Rolling Stones in 1967. It has been covered by various artists, most famously David Bowie in 1973. Released in the UK as a single in January 1967, “Let’s Spend the Night Together” reached #3 on the UK Singles Chart. The song was included on the U.S. version of the Stones’ album Between the Buttons, and was also released there as a single. However, due to the then-controversial nature of the lyrics (proposing a sexual encounter) most radio stations opted to play the flip side “Ruby Tuesday” instead. The two songs charted separately on the U.S. Billboard Hot 100, “Let’s Spend the Night Together” stalling at #55 while “Ruby Tuesday” became a #1 hit. Both “Ruby Tuesday” and “Let’s Spend the Night Together” feature piano by Jack Nitzsche. In one of the more famous examples of musical censorship, on The Ed Sullivan Show, the band was initially refused permission to perform the number. 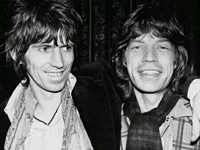 Sullivan himself told Jagger, “Either the song goes or you go”. A compromise was reached to substitute the words “let’s spend some time together” in place of “let’s spend the night together”; Jagger agreed to change the lyrics but ostentatiously rolled his eyes at the TV camera whilst singing them. In April 2006, for their first-ever performance in China, authorities prohibited the group from performing the song due to its “suggestive lyrics”. A live version appeared on “Still Life” (American Concert 1981) (1982). After performing the song on a 28-date European tour in spring 1967, it was not until 1981 that The Rolling Stones next played “Let’s Spend the Night Together” live in concert. It was often performed on the 1981 and 1982 tours before being again retired for 15 years. The song has been a mainstay of their live performances during their two-year A Bigger Bang Tour.